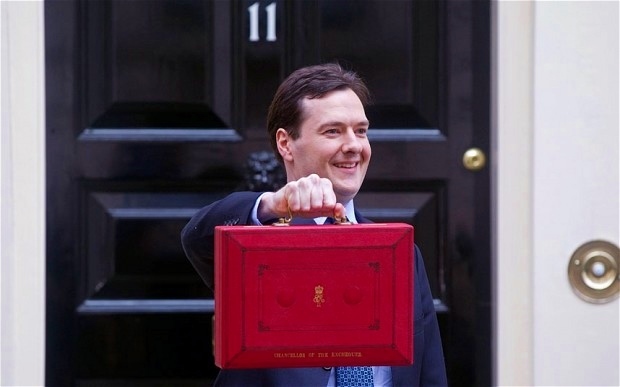 Budget 2013 – political sense or Whitehall washout ? Smiling…for now. The Chancellor sets out his budget aims. UK Chancellor George Osborne virtually pleaded with the nation today to stay with him despite the economic gloom. And you can stay with him on Twitter as he started tweeting today; One thought he may have tweeted the budget rather than in person. In his fourth budget, Osborne declared that the UK would avoid a “triple dip” recession, despite slow sales on high streets across the UK. The Chancellor aimed the budget at people who wanted to “work and get on”. In other words, those people who earn the money, pay tax and can afford to cope with the new budget aims. In a range of measures announced at Westminster, Mr Osborne announced there would be more help for first time homebuyers. Taxpayers will foot the bill for the new scheme, Help to Buy, allowing buyers to put down a 5% deposit on a newly built house. 20% of the payment for the house will be through a “shared equity” loan which means the government will effectively take a “stake” in the property; The loan will need to be repaid by the borrower before the house is sold. You may ask at this point how the economy will benefit. Because of the type of loan, if the price of the home has doubled at the time of selling, then so will the loan and indeed the buyer repaying will have a larger bill to foot. However, the risk being made by the government is not knowing how many home valuations will actually decrease or stay the same rather than increase. In other announcements, a number of mispredictions have been put right…for now. Osborne made a U-Turn on his prediction of growth in the economy. Four months ago, he stated that growth will be of 1.2% avoiding a “triple dip” recession. Today that figure was revised to 0.6%. In another misprediction, Chancellor Osborne declared that the national debt of the UK will continue to increase and not start to come down until at least 2017 – two years more than the coalition’s original estimate. Much of the budget announcement seemed to be like a U-Turn or a road diversion, taking away emphasis of the gloom of the economy onto the positives the government see themselves as doing. The dithering on fuel duty tax came to an end at lunchtime when Osborne announced that the planned increase on the tax would be cancelled altogether. Instead the current 57.95p per litre will stay in force for two years. To put it into perspective, Osborne, who travels in government vehicles and first class with Virgin, used ordinary cars such as the Ford Focus and Vauxhall Astra to connect with the ordinary voter. The good news is that if you do own a smaller engine car, the driver will be paying around £7 less. So what about the government Range Rovers and Jaguars? Cuts to Whitehall departments will save £2.5bn which will be used for new infrastructure projects, whilst a cut to the amount of National Insurance employers pay per employee will be decreased allowing more money to be spent on providing more jobs for the 2.52 million people currently out of work. It appears that the Chancellor has put a positive light on himself and the government, helping homebuyers, motorists and business’, however the fact still remains that the UK economy is in a very dire place. There is limited money to spend and economic predictions appear to have been miscalculated…by the man in charge of the country’s finances. Whitehall does take the brunt of the cuts and perhaps in some areas of todays speech, there is some political sense. The leader of the opposition, Ed Miliband, made it clear that the Chancellor had promised a return to “good times” three years ago. Three years on and those promises still have not come true. But despite the misery, gloom and slow growth, there is at least some light in your local pub – George Osborne announced a 1p cut from the cost of a pint of beer this lunchtime. That’ll be 1p less on tonight’s House of Commons bar bill. Town remembers terrorist attack, 20 years on.